I didn’t see Sunday or Monday’s trades coming, which is the way most Brian Cashman trades happen. The Yankees traded Chasen Shreve and Giovanny Gallegos to St. Louis for first-base depth, traded Adam Warren to Seattle for international bonus pool money and traded Tyler Austin to Minnesota for Lance Lynn. 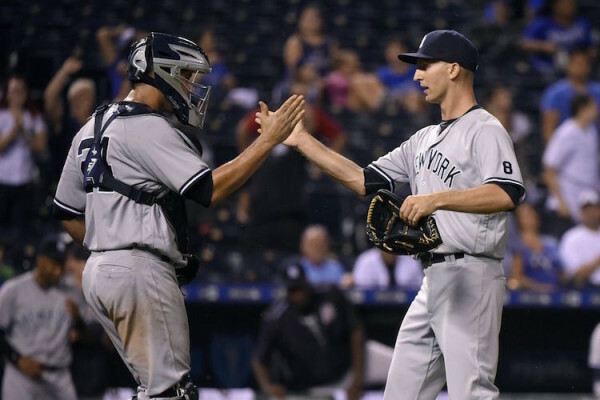 A day after trading Chasen Shreve to St. Louis, the Yankees got rid of another bad bullpen option in Warren. The less bad options Aaron Boone has to ruin a game, the better off the Yankees will be. No, Warren wasn’t as untrustworthy as Shreve, but to me, he was the next in line of relievers I don’t want to see in games (not counting A.J. Cole, who only pitches in blowouts one way or the other). I will always be thankful to Shreve (along with Dellin Betances) for keeping the 2015 season afloat while Andrew Miller was hurt. After Shreve got knocked around at the end of 2015, I never thought he would still be a Yankee nearly three years later. He had a good run, but it’s time to move on from him. Aside from his heroics against the Mets a couple of Saturdays ago when he got out of a bases-loaded, no-out jam to save Aroldis Chapman and the game, his season was full of disappointment. Warren’s time with the Yankees was weird. He pitched to a 3.40 ERA in 20 starts and 246 relief appearances, and while he was actually mostly reliable, it never felt that way. It always felt like he was letting inherited runners score, or blowing a lead, or turning a one-run deficit into a two-run deficit, or losing a game in extra innings. He should have most likely been a starter since he performed well in that role in 2015 before losing his rotation spot to the return of Ivan Nova (good decision by the organization) due to the Yankees’ lack of starting depth in recent years. The Yankees already traded him once to acquire Starlin Castro and then got him back in the trade Aroldis Chapman-Gleyber Torres deal. Now Warren is off to his third team in as many seasons, and I’m petrified of the thought of him setting down Aaron Judge, Giancarlo Stanton and Gary Sanchez in the eighth inning of the AL Wild-Card Game. There are a lot of things not to love about Cashman, but I love his obsession with trading for international bonus pool money. I have a feeling the rules are going to change when it comes to these types of trades, but as long as it’s allowed, keep doing it. Torres, Gary Sanchez, Luis Severino and Miguel Andujar were all international signings, and the more bonus pool money you have, the more players you can sign, and the more players you can sign, the better chance you have of hitting on a few of them. I will always remember Tyler Austin for being the front end of the back-to-back home runs with Judge in their Major League debuts in 2016 and for charging the mound against Joe Kelly in Boston in April. Austin wasn’t very good, batting .230/.287/.459 in 85 games for the Yankees, didn’t really have a position, was often injured and needed injuries to create everyday playing time for him in the majors. He could always run into one here and there, which he did eight times early this season, to help the Yankees’ offense in the absence of Greg Bird, but Austin was never going to get a chance to play consistently with the Yankees. Much like the trades of Brandon Drury and Billy McKinney, who also were never going to be everyday players for the Yankees, Austin is better off somewhere else. I’m not a fan of Lance Lynn. Mainly, because he isn’t good. That, and his poor performance, allowing three earned runs in 5 2/3 innings in two appearances in the World Series against the Red Sox, taking one of the four Cardinals’ losses in that series. I’m not a fan of anyone from that Cardinals team, which helped explain my opposal of Matt Holliday being a Yankee in 2017. Supposedly, the Yankees plan is to use him as both a starter and reliever, though I’m not sure how that will work since once he’s relieving, he would need to be stretched out as a starter. And I don’t see how he’s better than any rotation option they have now, and that includes Sonny Gray. If the Yankees plan on skipping starts to give their starters extra rest over the last two months, which wouldn’t surprise me since they are more concerned with rest than winning games, then that’s an even worse plan than trading for him. Ultimately, this move made little sense for the Yankees. The Yankees got better after they traded for Zach Britton and J.A. Happ. They made the best bullpen in the majors even better and they added veteran stability and a left-hander to the rotation, who has had solid success in the AL East. The moves from Sunday and Monday don’t really make the Yankees better this season. They make them better for after the season by clearing 40-man roster spaces and giving them even more international bonus pool money to use to help the future of the organization. The Yankees are just as good today as they were 48 hours ago, and that needs to be good enough to catch the Red Sox and win the AL East.